In the process of creating our field service sales CRM, we talked to a number of green industry businesses about the issues they have in their sales process. 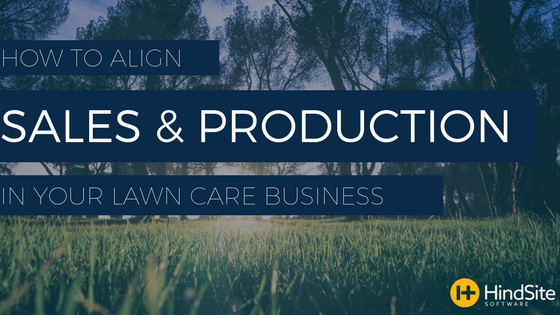 One that reared its ugly head frequently - especially in lawn maintenance businesses - was the tension between sales and production. Sales will visit a property and their goal is to sell it. In a typical lawn maintenance business, creating an estimate usually involves learning the square footage and what we call the difficulty factor - what obstacles could slow down the job? And then determining what equipment will be used. That’s where the tension between sales and production begins. Sales likes to bid as low as they can in order to earn the sale and, thus, a commission. So sales may see a property and assume they’ll use the most productive piece of equipment - the one with the 60” deck. They’ll also underestimate the difficulty factor. Those two assumptions will lower the bid and win the job. Now it’s time for production to perform the work. They’ll arrive with a 35” deck and find the job to be a lot more difficult than expected. It will take them longer than expected, eating away at profitability. Production will arrive back at the office and the owner will ask why it took so long. They’ll blame sales for underbidding the job. 1) Grab all your data from an extended time period and determine how long it took you to mow a certain amount of square feet, say 100 or 1000. That’s the new production rate that your sales rep uses to determine estimates. Hint: This is probably going to take someone who likes data analysis and will require some type of existing time tracking system. 2) Most manufacturers print production rates for their equipment. Find the production rates for all your equipment and determine the average of all those production rates for every piece of equipment given a specific square footage. You’ll probably still need to factor in a difficulty factor at some point in the bidding process. Whatever option you choose, your bidding process should be more accurate because you’re using a data-based approach instead of relying on a sales rep’s opinion. One thing I’ve learned is that good sales reps are motivated by money. It’s in their DNA. Yet, most businesses only commission their sales reps based on sales volume, not the profitability of the sale. Think about it: If your sales rep can sell a job that’s extremely profitable, shouldn’t they get paid for it? You’ve got more money to pay them. You’re rewarding them for behavior that makes your business more money. I admit this can be a balancing act. Your sales rep may lose more sales because he’s bidding higher in the hope of earning a bigger commission check. But if you can eke out more profitability per job, it may be worth it. You may lose revenue, but you’ll gain profit. Because it can be a balancing act, it may be worth a blended model. Give your sales rep a couple extra percentage points, a $50 gift card, whatever you think will incentivize them to think twice before bidding low in order to win the business. Set a profitability threshold and reward them in addition to his regular commission. We develop software, so our business is a little different than your lawn maintenance business. But one of the ways we test our software is by giving it to our entire team to try. They then work directly with the developer with any suggestions or bug fixes. The support and training team feels like a part of the development process, and the developers get feedback from knowledgeable HindSite users. It’s a win/win. Build a process for sales and production to share feedback. It could be a monthly meeting to go over any recently sold projects. Get everyone in a room - if only for 15 to 30 minutes - and look at the numbers. How accurate was the sales estimate? If it was significantly inaccurate, have production identify the problem. In some cases, it could be production’s fault. By sharing information and creating a feedback loop, your production team and sales team will both learn what the other was thinking, creating a much more harmonious relationship.